Sundials register the local Apparent Solar Time – the only time known to people of previous centuries. Nowadays, of course, time has been averaged out to produce Local Mean Time. The Equation of Time graphically illustrates the slightly eccentric course of the Earth as it orbits the Sun – an oval rather than circular journey, speeding up very slightly as it approaches the Sun, slowing down as it recedes from it. 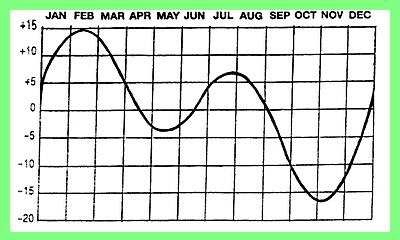 This graph can be used to convert sundial time to Local Mean Time, by adding or subtracting the number of minutes indicated beneath the appropriate date. Having decided on Local Mean Time, you can find Greenwich Mean Time by adding four minutes for every degree of longitude west of Greenwich, or subtracting four minutes for every degree of longitude east. To allow for Summer Time, or Daylight Saving Time when applicable, a further hour must be added. Unless specially made for a specific latitude, our horizontal dials are set for the average latitude of the British Isles and Northern Europe. Setting up a sundial in the garden could scarcely be easier: ensure that the base is horizontal and in a place where it will receive full sun. At 12 noon Greenwich Mean Time on a sunny day, position the plate so that the shadow of the gnomon corresponds with the 12 (or XII) mark on the dial. If you look at the Equation of Time graph, you will see that sundial time corresponds with clock time most closely on four occasions during the year. These dates are April 15, June 15, September 2, and December 24, so if you have choice, choose a day as near as possible to one of these. In the Northern Hemisphere the gnomon or pointer rises towards the north (and towards 12 o’clock). To be accurate it should point at the North Star, Polaris. Remember that the gnomon arrow represents the Earth’s axis, and thus should correspond with your latitude. If sighted correctly the arrow should point at the North Star, Polaris. The easiest way to set it up correctly is to use the sun. On full globe armillaries the noon shadow tends to be obscured by the Meridian ring, so it may be more convenient to use the hours of XI or I, making sure you are using Greenwich Mean Time. 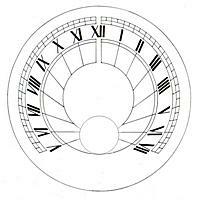 As with the horizontal type of dial, it is best to pick a date as near as possible to the four “zero dates” shown on the Equation of Time. 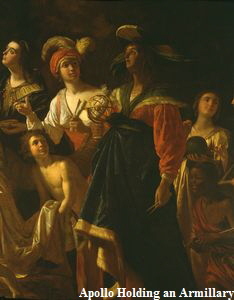 The earliest astronomers in classical times created their own concept of the Celestial Sphere, visualizing the Earth surrounded by projected bands of Colures, reflecting the Solar System as they saw it. Angled to correspond with the fixed point of the North Star, the Sphere indicated the apparent course of the Sun – the Path of the Ecliptic – around the central orb of the Earth itself, the Equator, the Tropics, the Meridian of the Solstice and the intersecting Meridian of the Equinox. The first Queen Elizabeth was probably familiar with this illustration of a full armillary Sphere which featured in a book published during her reign in the 16th century. By then it was realized that, with a time scale added to the Equatorial band they made reliably accurate sundials, and this became their chief use. As ornamental garden features they attract the eye, form a natural talking point, and seem to emanate a quality of ancient erudition. 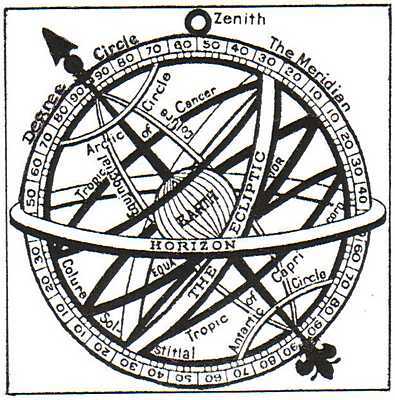 If your armillary includes the Band of the Ecliptic and a central orb, this can be seen as a self-contained three-dimensional model of the Celestial Sphere, with the apparent path of the Sun as it seems to encircle the Earth. looked at another way, the circle of the Ecliptic indicates the plane of the Earth’s orbit around the Sun against a background of stars, in particular the constellations of the Zodiac. 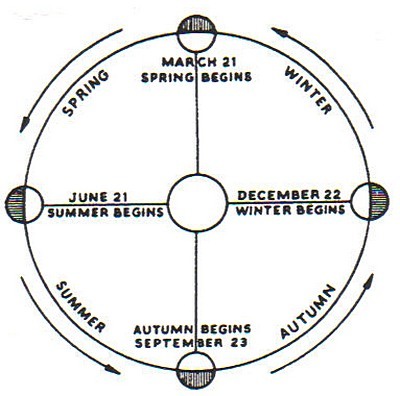 The two intersections of the Ecliptic with the Celestial Equator indicate respectively the first point of Aries, marking the advent of Spring in the Northern Hemisphere, and the first point of Libra, marking the commence- ment of Autumn. At the intersection of the Ecliptic with the Northern Tropic of Cancer the Sun is overhead on the 21st June, and at its intersection with the Southern Tropic of Capricorn the sun is overhead on the 22nd December. Summer in the Northern Hemisphere, with the North Pole in daylight. Winter in the Southern Hemisphere, with the South Pole in darkness. Winter in the Northern Hemisphere, with the North Pole in darkness. Summer in the Southern Hemisphere, with the South Pole in daylight. Sundials and mottos naturally go together, often dwelling on the transitory nature of life and the relentless progress of time, coupled with the pleasure that sunlight brings and the gloominess of shadow. The seemingly snail-like progress of the shadow cast by the gnomon contrasting with the inevitable sense of time racing by: it creates an enigma that has captivated minds for many centuries. The Romans loved mottos, and were responsible for inventing most of them, including Tempus Fugit – which explains why they are often written in Latin.